Ashok Rathod is the founder of OSCAR Foundation that trains slum kids to learn football and empowers them with life changing life skills, right attitude, belief systems through the course of game. He believes in "Education With A Kick". Read ON! Ashok Shankar Rathod has become a name to salute in recent times. For those of you who are unaware of him, here is a brief story of this phenomenal personality. There is a quote in regional languages which says that a lotus is born in swamps only. Same is the story of Ashok Shankar Rathod who was born in the biggest slum of Asia in Mumbai called as Dharavi. He spent all his childhood in this slum playing around with slum kids. He stands as a diamond hidden amidst the coal without losing its glitter. Let's see further as to how this diamond shone with glo-ry coming out of the difficulties burden of coal. In slums it is quite normal not to expect people to know English. In fact expecting educated people in slums is a big dream to accomplish. So was the case in Dharavi as well. Children used to complete their primary education and drop from schools as soon as they entered secondary because they were supposed to study English also. Some used to get jobs in the coasts to load fishes into boxes which could pay them Rs.200 per day. So many felt earning would be better than studying and dropped schooling to jump into jobs. Unfortunately they were less aware as to how to spend this money and started getting into all types of bad habits like smoking, drinking and gambling. This is the bane of money in the hands of the uneducated. Ashok Rathod also wanted to work but was prohibited by his strict father as he didn't want Ashok also to get into such bad habits. But luckily Ashok was allowed to work in an NGO that taught sports to slum kids. Ashok found that kids started enjoying when he taught them football. In slums where people think of planning their 2meals a day, Ashok thought about the futures of these kids. He encouraged them to study while teaching football. Then he made the condition that they must study well and not drop out of schools if they wanted to continue learning football. As a result of these he was able to get 600 slum children to go to schools and also got the people in slums to send their 150 girl children to schools. All this work didn't happen in just a mere number of days or weeks or months. It took 4 years to make all these happen amidst the comments of people and finally OSCAR (Organization for Social Care Awareness and Responsibility) was born under the Leadership of Ashok Shankar Rathod who was just in his early twenties. 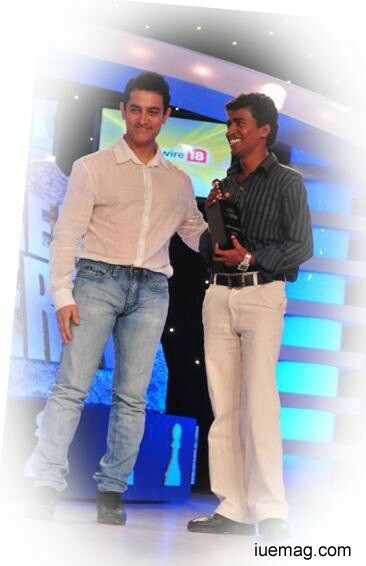 Because of the tremendous work of OSCAR, Ashok Shankar Rathod was awarded the RELIANCE Real Hero award and the award was pre-sented by the Bollywood superstar Aamir Khan. Within three years of starting OSCAR, Ashok Shankar Rathod was invited to global youth conferences to represent India and to share his success story to inspire more people. He has been featured in 67 plus newspaper articles and interviewed by numerous television channels. When he was asked to share his message for the youth, he replied, "each one of us take so much from the society right from our birth to death. So it's important for each one of us to realize that we should con-tribute back to the society as well". With the grace of God OSCAR has reached Six states of India impacting 1500 kids and they have a target of reaching 5000 kids all across India in next 5 years. Let's wish them the best wishes and let more and more young leaders like Ashok Shankar Rathod be born in this world is the wish IU e-magazine team makes on the first anniversary of its existence.